The natural habitat of a spider is comprised of its natural surroundings and food sources. The contents and climate of a spider habitat can range significantly, based on the geographic location of the spider and the species. Generally, it is believed that spiders live in nearly every ecosystem in the world, with the exceptions of high altitude, underwater, or arctic environments. Many of the species of spider found in the world have needed to adapt and evolve in order to survive, resulting in many variations of mannerisms from species to species and locale to locale. Though there are many variations in spider habitats, a couple of things they all have in common are availability of food sources and endurable variations in climate. Some examples of variations that a particular species of spider might have include preferring a habitat that permits the building of funnel shaped webs as opposed to the large net-like web that some of the species will spin. Spiders like the domestic house spider or the hobo spider have a construct funnel webs, and therefore may find a habitat that has many dark crevices. For instance, brick walls, rock piles, stone, and locations that contain heavy ground cover are hot spots for funnel-web building spiders. Specific types of spiders, like the crab spider, do not require any webs at all because they actively seek out and hunt their prey, rather than wait for prey to come to them as web building spiders would do. Species of spider like this need to live in an environment that is outdoors and heavily inhabited by insects. Such locations exist in the form of flowerbeds, gardens, and open meadow areas where hunter spiders will not only survive but thrive in. 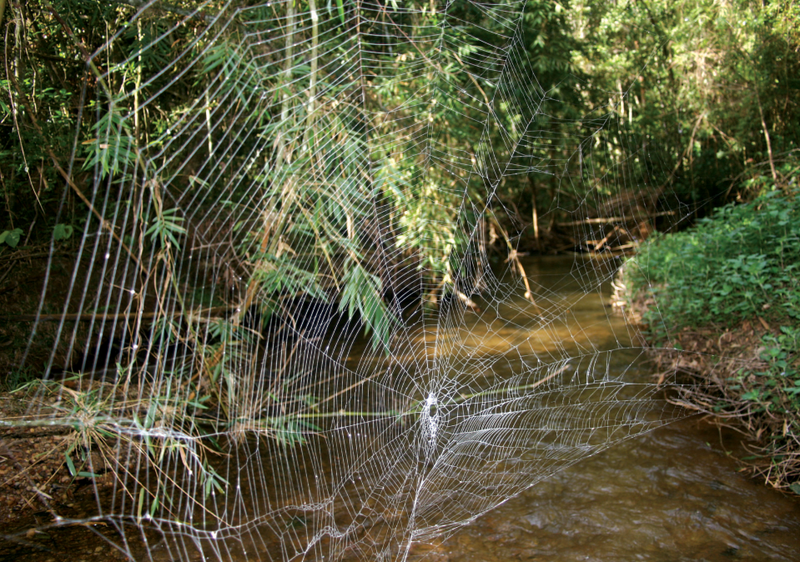 Spiders similar to the orb spider are well-known for spinning large, elevated, net-like webs. These spiders typically feed on flying insects that get snared by the web, and require a habitat where flying insects are abundant. Web spinning spiders tend to establish their homes on trees, shrubs, underneath the eaves of houses, or even inside the aforementioned areas rather than just outside. In general, spiders are highly adaptable and can survive in nearly any environment. When a small amount of spiders are taken out of their natural habitats and moved to new ones, sometimes they develop new traits that are passed down the generations that allow the babies to better thrive in that habitat. An ideal spider habitat needs to provide them a stable supply of insects to feed on, and a climate that will not reach extremely cold temperatures. As long as these needs are met, most spiders can and will adapt to the habitat and continue to survive. “Caerostris darwini web” by Ingi Agnarsson, Matjaž Kuntner, Todd A. Blackledge – Lalueza-Fox, C., Agnarsson, I., Kuntner, M., Blackledge, T. A. (2010). Bioprospecting finds the toughest biological material: extraordinary silk from a giant riverine orb spider. PLoS ONE 5: e11234. doi:10.1371/journal.pone.0011234. Licensed under CC BY 2.5 via Wikimedia Commons.